Ever had something you’ve been thinking about for a while and then all the sudden you just need to do it right now? Well for quite a while I have been wanting to spice up my wall that I do a lot of workout videos in front of…and by spice, I mean GLITTER!! 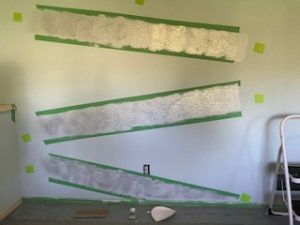 And 2 weeks ago, during one of my video rants I declared (yes, declared, it is a much stronger statement than said or told you) that I would glitter paint the wall by the following week. 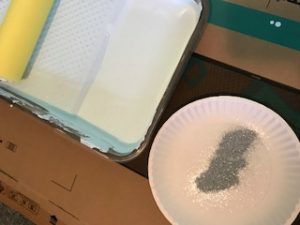 Keep in mind the idea of a glitter wall came a couple years ago while we were painting our deck and I say a bag of paint glitter in the paint department and that was all I knew about glitter walls. Also, I do not do the painting in our house nor do I generally care if Hubby wants to paint as long a s I don’t have to help. After my video declaration, I hunted down the paint from that room, gave it a shake to confirm still liquid and decided on what I believed I needed. This is painting, no big deal, I got this… (insert massive eye roll). 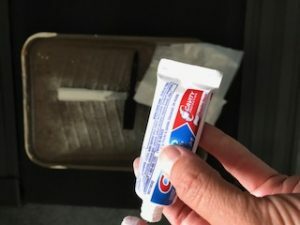 Tuesday, I headed to the local home store for the paint roller and tray liner. I was set. It got too hot for a couple days so finally Saturday was the day, and this would be done by the declared finish date. 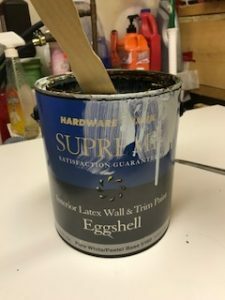 I began rounding up supplies when hubby dear tells me I cannot start painting until I patch the holes in the walls…WHAT? He got out the massive can of wall patch only to discover it was dried out. 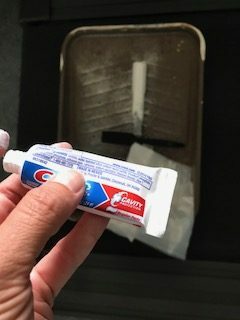 So, toothpaste!! Ah, back on track. Patched the walls. 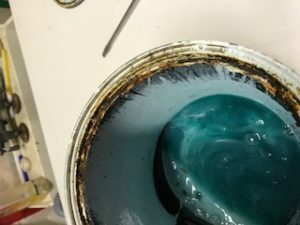 Hubby dear opens the can of paint…oh oh, while it sounded like liquid it had separated beyond help, commence search for that other full can…found it!!! But hubby says I must take it to the store to get it shaken as 6-year-old paint is way beyond stirring?!?! Another delay, through the 8 miles of road construction I went. 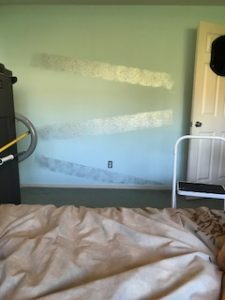 Sunday hubby dear helped me tape the wall, stir in the glitter and sent me on my way. What a disappointment. I could not see any sparkle in the can or on the wall. DISAPPOINTMENT. So, I turn to my girls who send me YouTube videos…turns out there are some helpful hints there. I also pout on Facebook and am given more hints. Turns out all I had done was paint the glitter and then the wall. Wish I’d have asked advice before this massive waste of precious time. Go get more glitter. Luckily, I still had paint left! Wednesday, armed with my new advice and tutorials I tape up the design on the walls, gather up a plate for the glitter and one to catch the extra glitter, pour more paint and pray!!!! Cool story Denise, how does this relate in any way, shape or form to fitness? So…tons of people paint walls every day and they are not professional painters! Hubby dear has painted frequently so really, this is not a job for a pro. It certainly didn’t look that hard. Just get a brush, add glitter and go! But oh, that prep work! And oh, the technicalities of shaken not stirred paint. And what about all those added tips around the glitter?! Tons of people have lost weight or gotten more fit by themselves. How hard can it be, go to the gym with all that equipment, get on it and go! Spend weeks or even months before realizing that you are not getting the results you had in your head. Turn to your friend who gives you a magazine filled with workouts and promising pictures of success stories. Try it, maybe you’ll get the results you want. Maybe it’s good enough…maybe you’ll give it a few weeks before you decide. Maybe if I had gone to a professional painter, described my vision I would now have exactly what I wanted on my wall. 2 weeks ago. 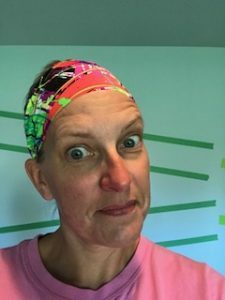 Maybe if you’ve never done a weight loss program you should seek out a professional and ask what the best way to start is, how to best use the equipment, and if there’s any prep work (like food stuff or stretching). Now maybe it will cost you a couple hundred bucks but you won’t get hurt because you know how to use the equipment, and you’ll get results right away because you skipped all the experimenting to get just the right look. Are you ready to dive in and finally declare your health will no longer rely on a New Year’s start date? That October is a great time to start a health journey too? Awesome! Send me a text 612-202-0448, and we will set up a time to talk about what you want to do so you can get there in record time.